A 58 year old woman presented with severe SOB. Chest x-ray revealed a hilar mass. 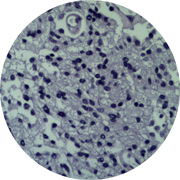 Biopsy showed a monotonous population of round to oval cells with granular chromatin and abundant clear, vacuolated, cytoplasm. Tumor cells are arranged mostly in sheets. Scattered foci of cells with scant cytoplasm are present. Necrosis is not seen and mitotic figures are not conspicuous. Immunoperoxidase stains show that the tumor cells stain strongly positive with CK8/18, synaptophysin, and chromogranin.The proliferation rate (Ki67) is 1-2%. Mucin stain is negative. The staining pattern and histologic features are most compatible with a typical carcinoid tumor with clear cell change.